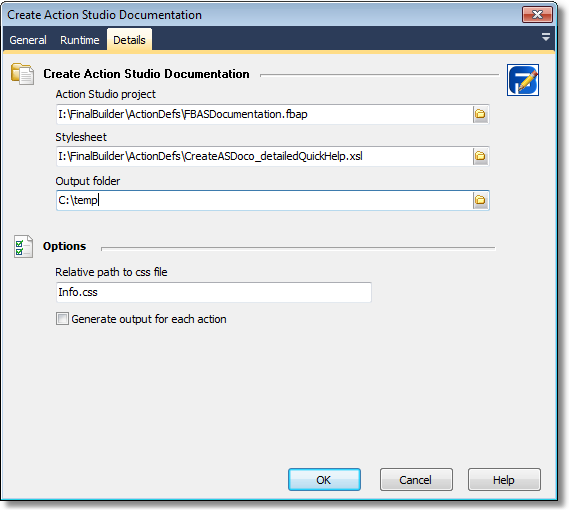 This action will generate documentation for your actions written in ActionStudio. There are two xslt stylesheets included in the installation which can be used. They are located in the Stylesheets directory, and called "CreateASDoco_ListActions.xsl" and "CreateASDoco_DetailedQuickHelp.xsl"
Relative path to css file - specify the path to the .css file you want to use for the html. The default .css file is the same one used by the other actions.